A scalper system only work during Asian hours. Several unique indicators to detective the price fluctuation. Dynamic TP/SL level according to market conditions. 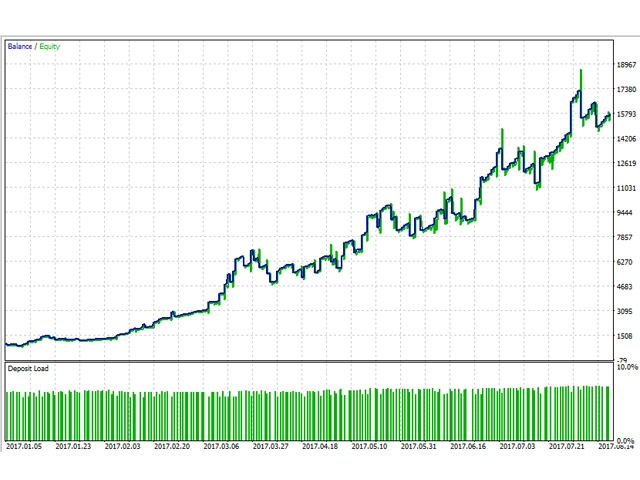 Fixed stoploss to protect the capital, very low risk of losing a lot of money. No need to obtain SET files. The parameters are the same for each currency pair. It is optimized to work on EURAUD. It is recommended to use Eagle Scalper on M15 chart. 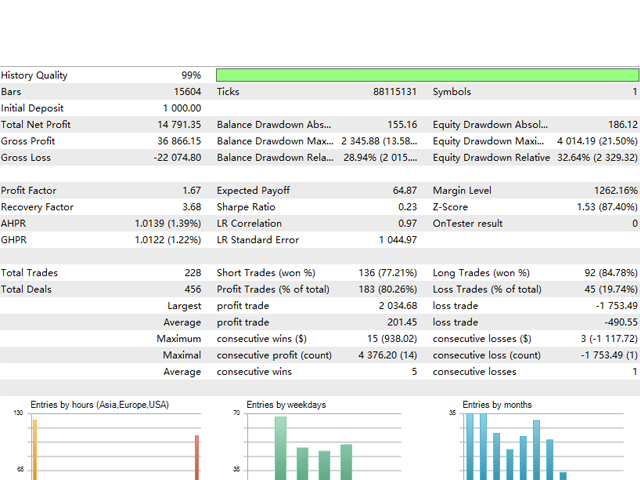 It is recommended to run it on a real ECN broker with very low spread. It is recommended to set the "Risk" below 10. It is recommended to do 99.9% modeling quality backtest. Lots - use fixed lot size. Risk - calculate the lot size dynamically as a fixed value of the capital, only works when the "Lots" is set to be 0. 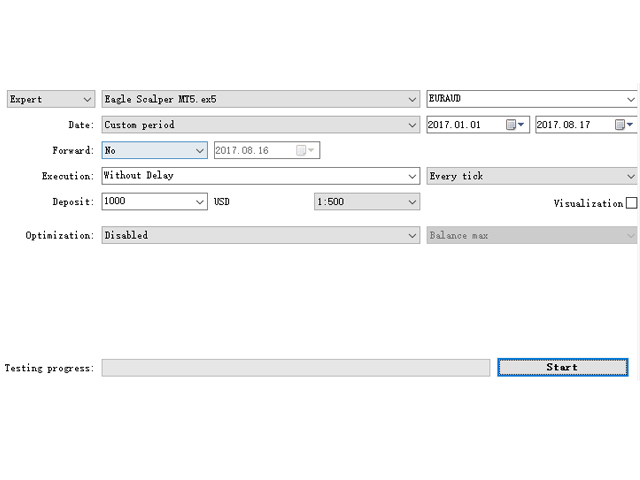 Auto_GMT_Offset - If true, when live trading, GMT_Offset will be automatic calculated by the EA. GMT_Offset - when backtesting enter the GMT time of your broker. When trading, it is automatically set by the system. EA_Comment - place your personal comment. MAGIC - magic number, it is set for each currency pair by default. Max_Spread - maximum spread allowed to open an order. Show_Info - Turn on/off info panel on the chart. TakeProfit - take profit value of each order. StopLoss - stop loss value of each order. Open_Hour - start trading hour. Close_Hour - end trading hour. Trade_On_Friday - turn on trading on Friday. Friday_Hour - end trading hour on Friday. Allow_Second_Order - choose the option if you allow a second order. Second_Order_Distance - the distance between first order and second order. Second_Lot_Factor - the lot size factor of second order. Use_Internal_Inputs - if true, EA will use internal value for the inputs below; If false, EA will use value that you give to the inputs below. Use_Indicator1 - turn on Indicator1. Indicator1_Period - the period of Indicator1. Indicator1_Entry - the entry value of Indicator1. Indicator1_Exit - the exit value of Indicator1. Use_Indicator2 - turn on Indicator2. Indicator2_Period - the period of Indicator2. Indicator2_Entry - the entry value of Indicator2. Indicator2_Exit - the exit value of Indicator2. Use_Indicator3 - turn on Indicator3. Indicator3_Entry - the entry value of Indicator3. Indicator3_Exit - the exit value of Indicator3. A new parameter is added. 1. Closing order incorrectly when time is after trading session. 2. Allow_Second_Order didn't work properly.